I'm not feeling well these past few days, got a runny nose, probably due to changing weather. And whenever I'm not feeling well, I love to have steaming hot soup, hot spicy noodle soup for that matter. So last Monday, I decided to have beef wanton noodles for dinner. I went to Chowking and ordered for it; unfortunately, it wasn't available (it was near closing time when I went to Chowking - Trinoma food court). 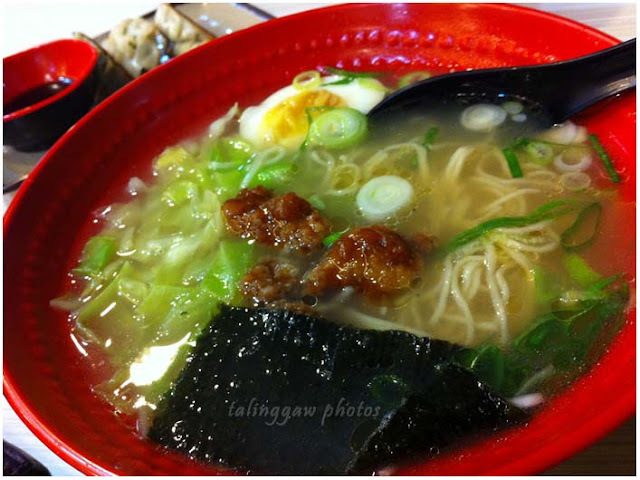 Since I'm really craving for a hot soup at that time, I went back to Trinoma ground level to go to Tokyo Tokyo. I was supposed to order bento meal with hot miso soup but I found out they now have ramen, so I ordered for it instead. Tokyo Tokyo has three ramen flavors - braised pork, spicy chicken, and tempura miso. It can be ordered ala carte or combo (with a choice of mantao or gyoza and a glass of red iced tea) in snack or regular size. I had no idea how small their snack size is so I ordered for the regular size, combo meal for 200 pesos. Sarap nito mainit masabaw and spicy esp ngayong snowy weather! I'm not that familliar of ramen, yung last time na kumain ako nito eh hindi ko pa ata alam na ramen pala yun. I want to have one again at feeling ko alam ko na where to grab hehe.